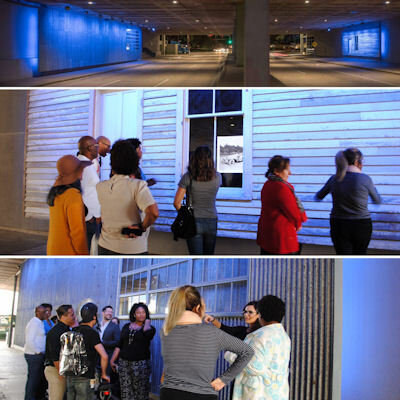 March 20, 2017 -- The Bagby Street passage under Bayou Place, between Capitol Street and Texas Avenue, is now home to the newest addition to the City’s Art Collection. The Houston Oracle in Two Parts by sculptor Stephen Korns honors the city’s history while also improving the pedestrian experience in the Theater District. Korns used photographs, video, sound, reclaimed materials and special lighting to turn the underpass into a multimedia work of art. Like the artist’s signature Lunar Lighting project along Buffalo Bayou, the lighting for this new artworkchanges nightly with the lunar cycle. Stephen Korns is a sculptor with an extensive resume of site-specific installations in the United States and in Europe. He has created designs for environments ranging from individual rooms to public parks, plazas, bridges and highways, and from urban waterfronts and large industrial structures to historic town settings. In developing the artwork concept and design, Korns considered the site’s proximity to historic City Hall, Houston Public Library, Sam Houston Park, neighboring theaters and the adjacent Buffalo Bayou. The Houston Oracle in Two Parts is an ode to familiar architectural styles and the history of the city. Two wall panels of reclaimed residential siding and industrial corrugated metal are positioned opposite of each other where Bagby Street passes under Bayou Place. Inset in one wall is a 60-minute looped video showing the hand of an archivist as she positions portraits of Houstonians photographed between 1870 and 1970 in workplaces, social gatherings and family settings. The video on the opposite wall features hours of views of the Earth captured from the International Space Station. Voices of Houstonians asking questions about life in the city can be heard intermittently through eight separate audio streams. Advanced LED luminaries and a sophisticated lighting control system provide improved sidewalk and roadway lighting with a coordinated daily changing light program. The wall panels are cast white at night on each full moon, then turn to blue on the new moon two weeks later and return to white on the next full moon. Korns worked closely with the General Services Department, which oversees construction for the City and Houston Arts Alliance, which is under contract to manage Civic Art projects for the City. The artwork is funded by the City of Houston Civic Art Program, with additional support from The Cordish Companies. In 1999, the City of Houston established an ordinance mandating that 1.75% of qualified Capital Improvement Project dollars be set aside for civic art. The program is managed by the Mayor's Office of Cultural Affairs.